CardioLog Analytics allows you to easily integrate with Microsoft’s SharePoint Online solution for both intranet and public internet SharePoint sites. Configure a public DNS name for the CardioLog server. If you have a secured SharePoint Online site, create a certificate (purchase SSL certificate from a certificate authority) for the CardioLog server and configure SSL for the CardioLog web application. Verify that the CardioLog Tracking Agent web application supports Anonymous Access - Click the CardioLogAgent web application in IIS, choose Authentication, enable Anonymous Authentication and disable Windows Authentication. Verify that the CardioLog Tracking Agent web application is accessible over the internet. Note: The URL should be accessible over the internet. Upon activating CardioLog Analytics, the Configuration Wizard will be displayed. This wizard will help you configure the SharePoint Tracking Agent - a tool designed to monitor visitor behavior in SharePoint, and the SharePoint Adaptor - which provides the structure of your SharePoint Online site. Login to the CardioLog server with the CardioLog service account and verify that it has the required permissions before running the wizard. In the Welcome dialog, select the desired UI language (including date format). Under SharePoint Version, select SharePoint Online and then click Next. (1) Deploy the CardioLog tracking code through a SharePoint solution. Note: Please select one option only to add the tracking code. 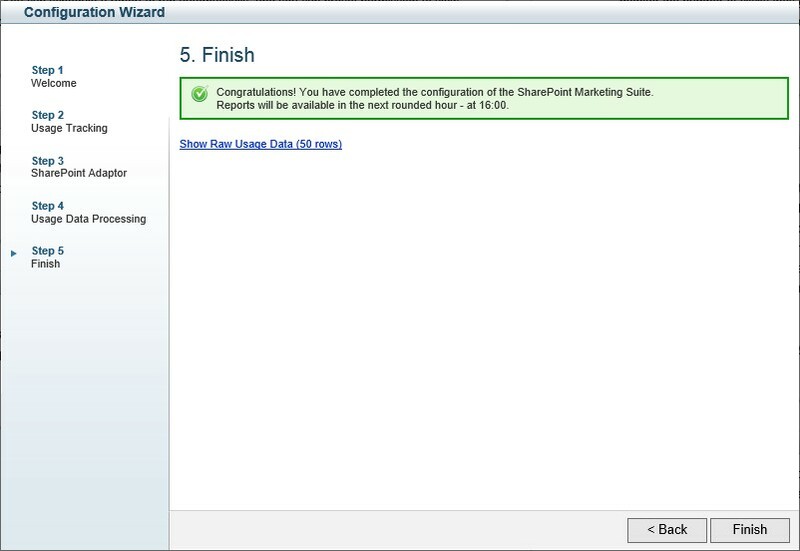 Copy the code from the Tracking Code box in Step 2 of the Configuration Wizard. Edit the tracking code and verify that the all URLs contained in the tracking code that redirect to the CardioLog application server, have the public DNS name and appropriate protocol. The URLs should be accessible over the internet. Use https if you are tracking secured SharePoint Online site collections and http for public websites. Open SharePoint Designer and add the SharePoint Online website: Go to Site Templates > Open Site > Enter website root URL (for example - https://intlock.sharepoint.com). Verify that the all URLs contained in the tracking code that redirect to the CardioLog application server, have the public DNS name and appropriate protocol. The URLs should be accessible over the internet. Use https if you are tracking secured SharePoint Online site collections and http for public websites. Open a new browser window and click Next Step. Delete your browser temporary internet files and click Next Step. Browse 3 pages on your SharePoint Online website and click Next Step. Click Test Event Collection. The Wizard will now verify usage events tracking. In the SharePoint Adaptor dialog, enter the name and root URL of your SharePoint Online site collection. Specify the authentication details used to connect to the website, then click Next. Loading your SharePoint Online tree structure may take several minutes (depending on the number of items in the selected website). Note: Please confirm that the CardioLog service account has the Site Collection administrator permission. 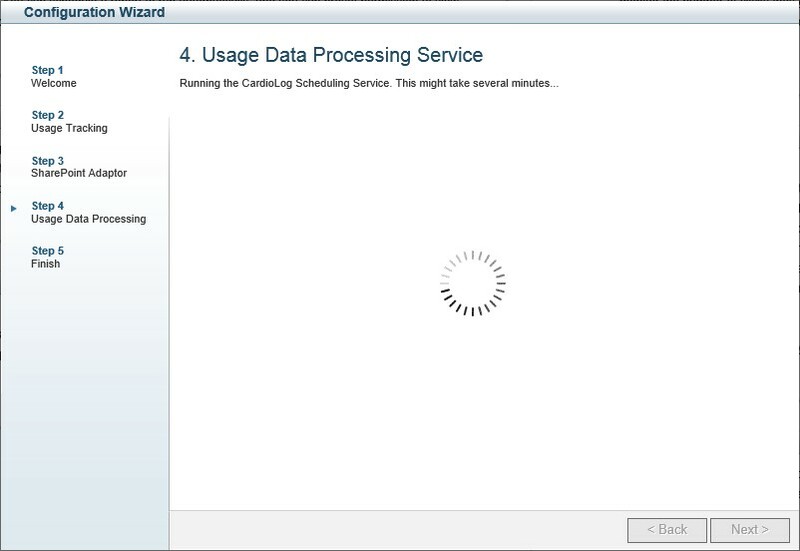 In the Usage Data Processing dialog, click Next. In the Finish dialog, click Finish. Click Show Raw Usage Data to view the usage events collected thus far. The data will be available in reports in the next hour. In the Administration pane, click System Configuration, and then select SharePoint Tree Adaptor. Click on your SharePoint Online website and select the site collection/s you want to monitor. You can load your site collections list from a csv file. In order to create the csv file, use the Windows PowerShell for SharePoint Online Get-SPOSite | Export-CSV command, and enter the csv file path in the Site Collection List File Path (.csv) field. If you have many sites and would like to automate this process via a Power Shell script please see how to create a CSV file for your SharePoint Online site collections. Restart the CardioLog Scheduling Service. The tree structure will be refreshed the next day. Configure event collection - deploy the CardioLog Analytics SharePoint solution on your site collection/s or insert the code manually (to your master page). Click Add Farm, and then select SharePoint Online. Site Collection URL (https://): - enter the site collection URL in a secured format (https://). For public sites (http://) use the secured format and configure a URL Mapping. For example - ^https://intlock-public.sharepoint.com > http://www.intlock.com. With URL mappings you can define modifications that should be made to the URL address while creating the tree structure for SharePoint Online public sites. For example: pattern - ^https://intlock-public.sharepoint.com, action - http://www.intlock.com (the pattern is a regular expression search pattern and the action is the replace expression). Site Collection List File Path (.csv) - you can load your site collections list from a csv file. In order to create the csv file, use the Windows PowerShell for SharePoint Online Get-SPOSite | Export-CSV command. Authentication - Windows Live ID (Office 365). The selected account should have the Site Collection administrator permission. Select the site collection/s you want to monitor and click Save. Copy the tracking code from the Tracking Code box in the Administration pane > System Configuration > Usage Tracking Code, and then select SharePoint Online. Click on your SharePoint Online website. Click on Publish Tracking Code.